This incredible full color 3-video set gives you a chance to enjoy the performance and thinking of one of Britain's most sought after mentalists and a creative force behind Derren Brown Mind Control. Here Andy Nyman performs and teaches some of his most exciting routines. Take your front row seat for a private performance at an exclusive nightclub in London's West End. In his unique and inimitable style, Andy Nyman performs some of the most direct and powerful routines that have earned him a reputation as one of the world's leading mentalists and creative thinkers in the world of Magic. The Show - At a private club in London's West End, Andy performs the following routines at full Nyman energy - The Hidden, No Way Out, Chair Swindle, Kick In The Head, Mr. Saturday Night, Charade, Deep Red Prediction, The Dead Zone, Magician's Graphology and the stunning Dead of Night. This is a show in front of real people with real reactions. The Explanations - Assisted by Ali Cooke and Pete Firman, Andy explains every routine in full detail. No stone is left unturned. The Extras - Over 1.5 hours of extras including - Inside the Mind of The Diamond (a 45-minute interview with Andy by Marc Paul), The Secret to Spectator Selection, The Nyman Cut, The Sophie Trick (performance only) and Andy's legendary Svengali Demonstration, plus"???" - the mystery clip you will not believe! And much much more. From numerous appearances across the globe Andy has performed in a way that always leaves a lasting impression on those who witness his style and here he shares invaluable tips and tricks that will help you to achieve similar results. Andy's thoughts and advice on spectator management are alone worth the price of this incredible three-disc set and will be invaluable to the working performer. Always powerful & often hilarious this is real world mentalism for the stylish, bold performer. 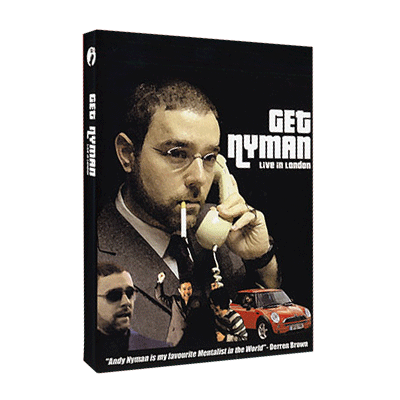 "Andy Nyman is my favorite mentalist in the world. His performances are an absolute joy, full of punch, humor and superb acting. Watching him work has taught me a huge amount about how to make my performances have more impact." "The first time I saw Andy Nyman perform, I knew I was enjoying one of the best performances of mentalism for an audience I had ever seen, or ever would see. His brain runs on rocket fuel. His performances are original, funny, arresting, and rock solid theatre. I believe Andy Nyman is a magician playing of an actor."